Alessandro Gentile has been interview by the official Fiba world website (www.fiba.com). Here what he said. FIBA.com: What was it like playing against an NBA team and leading NBA players? Gentile: It’s a different type of basketball. FIBA basketball is a more team-oriented game and the NBA game is a matter of talent. I found out how incredible the athleticism and physical strength of NBA players is. FIBA.com: You had 11 points and 6 assists in the loss (105-75) to Boston. Do you expect to get more attention from the NBA scouts after that performance? Gentile: I describe the game against Boston as a learning experience. I enjoyed it, it was nice to face such a high level of competition, but I want to be down to earth. I think about the present rather than dreaming the future. FIBA.com: You’re not 20 yet (his birthday is on 12 November) but you have your place in the rotation of an ambitious Euroleague team and are considered one of the best overall Italian players. Is that enough to think that you will play for the national team at the next EuroBasket? Gentile: It is too early to talk about it. The Italian national team did a terrific job last summer, going undefeated. I was cheering for them. But I have no hurry. I am aware the players who earned the qualification for Slovenia come first. Now, playing twice a week and against Euroleague opponents, I am focused on Milano. FIBA.com: Is the silver medal you won at the 2011 U20 European Championship the highlight of your career so far? Gentile: Definitely. It was the final stage of a long run for our generation. We earned a fabulous result, even if I am still disappointed because of our loss in the Final against Spain. This medal was more important to me, because I earned it with a bunch of guys who had been with me since the U15 national team, so our relationship was very close. I have always felt something special when I played for the youth national teams. I have always been so proud to wear the Azzurri shirt that in the summer of 2010 I played two consecutive European Championships (U20s and U18s). FIBA.com: Your father Ferdinando won the Euroleague with Panathinaikos in 2000 and was a member of the national team for more than a decade. Does he still provide you with advice? Gentile: He follows my games, and my brother (Stefano, who plays for Caserta)’s games but we’ve grown up. I am 19 but it is my fifth season at this level and I have been far from my family so I have earned some experience and I need less advice. But Stefano and me always know our father is there for support – it is important. FIBA.com: What is the main goal with Emporio Armani for this season? 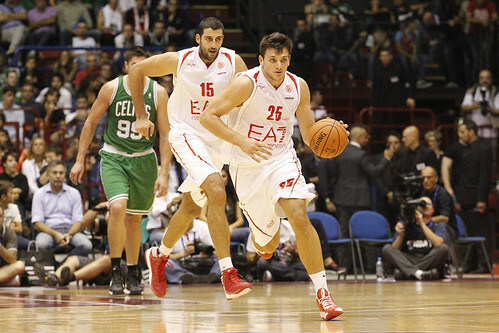 Gentile: We want Italy’s top spot, but our potential is good enough to be competitive in the Euroleague too. We are working hard to build our chemistry with an expert coach like Sergio Scariolo. We are improving game by game and it is good to play twice a week, as all these games provide enough minutes for all 12 players. I worked hard all summer to be here, I was able to recover quicker than expected from my injury, because I wanted to part of such an ambitious team. FIBA.com: What about your personal goals and objectives for the future? Gentile: I have always put an Euroleague Final Four at the top of my list. But I know that playing against Team USA in an international competition, like a World Cup, would be simply amazing.